You know those days where leaving the house is about as likely as pigs flying overhead? It's raining cats and dogs out, your other half has got the car, and you're left with mission (im)possible - how to entertain the kids within your four walls. Don't fret, you can do it! All you need is a little imagination and a lot of inspo. Endless amounts of fun are to be had with an old clothes hanger, a simple piece of string, and your kid's favorite toy. Fix your string to one higher point, e.g. a curtain rail, and the other end to a lower point, e.g. a chair leg. 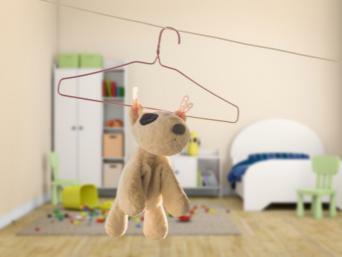 Then it's simply a matter of clipping their lucky toy's arms to a coat hanger, hooking the clothes hangover over the zipwire, letting go, and watching them go weeeeeeeeee! Get either one long piece of packing paper or connect several pieces of paper to make one long strip. Next, outline lots of different picture frames of all different shapes and sizes on the length of paper. Now it's time to hand it over to the kids so they can get busy with their inner Picasso. Let them conjure up pictures and paintings in each frame to fill up their art gallery, before sticking their creation up on a wall and getting them to give you a gallery tour of their works! There's nothing worse than being trapped inside the house with a load of kids whining at you about how bored they are. 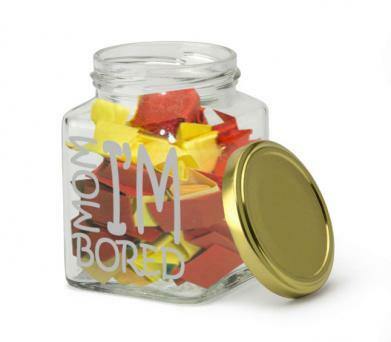 Thankfully, a busy jar offers the perfect solution to that old "I'm Bored" chestnut. Between you and your kids, think up lots of different activities that can be done within the four walls of your home, and then scribble them all down on snippets of paper, e.g. read a book, bake something, paint something, make gloop, put on a puppet show, etc. Fill the jar and have your kids take turns picking out activities to keep them occupied until they become...bored again! Then have another turn at picking out their next activity. Okay, so you might be far away from the beautiful bliss of being on a deserted island but that doesn't mean you can't dream, does it? Grab as many cushions as you can and scatter them in a big loop across the floor in one room, or even from room to room if you have enough! 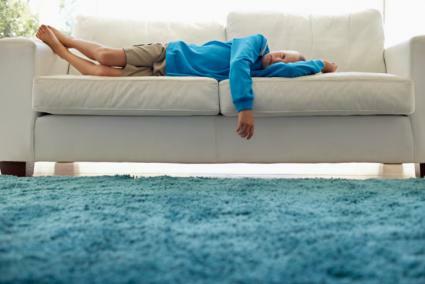 Then have your kids try to jump from one deserted island (cushion) to the next without falling into the sea (the floor). If they fall into the sea, they have to start again. 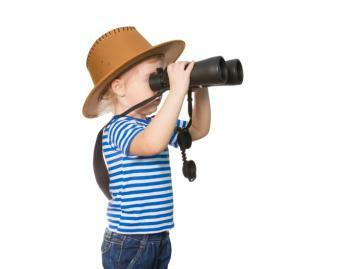 Encourage them to use their imagination and see what they can "spot" along the way, e.g. a pirate ship, a tropical bird, or an exotic tribe. 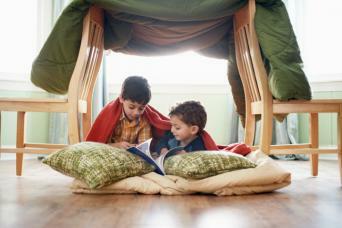 A blanket fort has the ability to turn the most mundane at-home day into something magical and thankfully, building a secret hideaway for your kids to play, dream, and scheme in is super simple. Make the ultimate kid's den by getting a large sheet and draping it over two pieces of anchor furniture, securing with some clothespins. Lay a comfy duvet or some sleeping bags underneath and scatter some cushions inside along with some books, toys, torches, and other amusements and voilá! You have your very own in-house fortress. Let your kids imaginations do the rest. Time for the wannabe witches and wizards to shine! Set up a magic potion lab for your littles by raiding the kitchen cupboard (think herbs and spices, sauces, oils, grains, stuff that fizzes, food coloring, and so on), grabbing a few mixing bowls, jugs, and wooden spoons. Let them run riot with curious ingredient combinations and their imaginations for some even more curious potion outcomes (for example, this one will make you look like a dog and sound like a frog!). 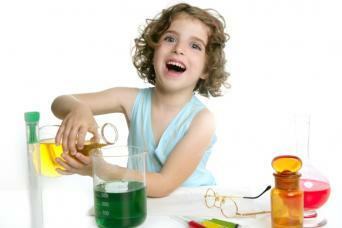 For even more hilarity, you can get them to pretend to "test" out the potions on their toys. You know what they say, one man's trash is another man's treasure, and never was this statement so true when stuck at home with the kids. It's time to raid the recycling and let your imagination do the work. What could you create with it all? A space station? A beach? A train passing through the countryside? A superhero small world? A construction site? A magic fairy garden? The world is your oyster when you've got the recycling and a collection of small toys are at hand. "Have paper, will make paper planes" should be the motto for every family stuck at home. 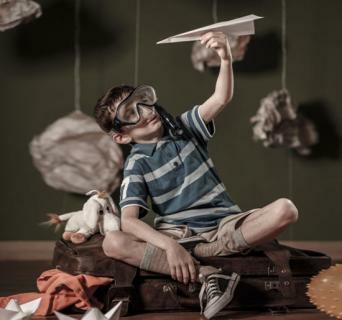 Make a bunch of paper airplanes and hold your own flying school. Or to take things to the next level, tape various pieces of paper together to make a huge posterboard-sized piece, and cut out holes of varying diameters into it with a point score for each one (highest points for the smaller holes, lowest points for the largest holes). Have them contend to see who can get the planes through the holes and rack up the most points! Seriously, impromptu discos are two a penny when you're stuck in the house. What you really need is a bubble wrap jump-a-thon disco. Dig out the old bubble wrap from your last move or all those Amazon deliveries and put it to good use by taping it down onto the floor like a runway. Stick some loud, obnoxious music on and have your kids burn off some serious steam by seeing who can keep jumping the longest or do the most bubble-popping jumps. Scavenger hunts are brilliant, as there are so many ways to spin them to make your four walls feel like the perfect place for exploration. Try a string scavenger hunt by attaching various objects around the house with string, and have your kids follow the string to find the items. Ask your kids to hunt for different colors or sounds in the house, have them unravel these clues, or use any mini animals, cars or characters you have lying around to devise a scavenger hunts with those. The possibilities are endless! Phew! Surely that's enough to keep the kids busy next time you're stuck indoors and leave the word boredom truly banished for the day?